I have to apologise for how long it's taken me to get this post up! I've been particularly busy for the past month, but here it is. 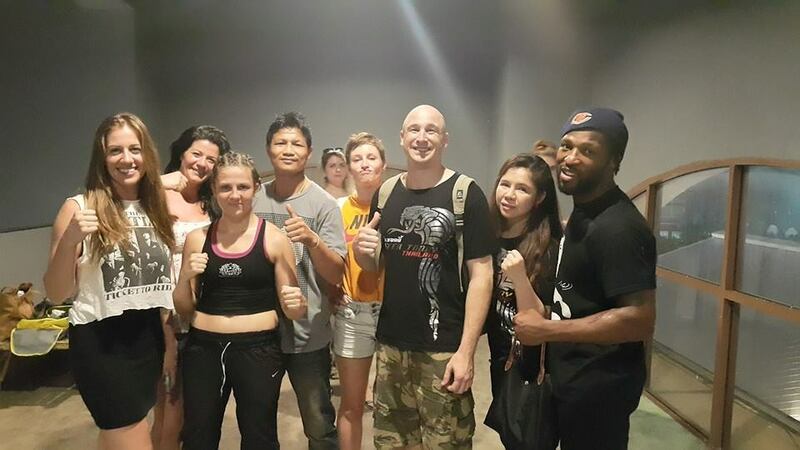 I was originally supposed to fight on 1st May at Asiatique, but had to cancel because of a nasty bout of Bronchitis (read my post on that here). After spending most of the week in bed, I got myself straight back into training to make up for lost time. As well as wanting to get back to 100%, I wanted to show my trainers how hard I was willing to work. I hated that I’d had to cancel and didn’t want anyone to think I was slacking. So, on my third day back at training when Kru Singh asked me if I wanted to fight at Asiatique in two days time, I said ‘yes‘. That afternoon was my last chance to get a real training session in before the fight, as I’d found out about the fight just as we finished the morning session. I happily attended, eager to get some good work in. However, it didn’t go exactly as I’d planned. There were no suitable sparring partners available and the girl that I was paired with was a complete beginner. That was fine for me, I’m always happy to help, but after we’d finished, I needed to find someone who could really work with me. On that day, the gym happened to be full of guys much bigger than me, so I asked Tu for some extra work. Tu is a very skilled fighter, so he was a good prospect because I can learn a lot from him, but he’s also around 25kg heavier than I am, which made it rather difficult. As we began sparring, a group of people were watching from beside the ring and I felt a kind of negative pressure coming from them, as if they were thinking ‘she thinks she can spar with him?‘ They all laughed, and I turned to send a death stare in their direction, after which they fell silent and let us get on with it, for a moment. Tu wasn’t hitting me that hard, but the weight difference made it feel much harder on my end and he wasn’t pulling back to make up for that, probably because he never spars with anyone my size. In fact, he’s always sparring with much bigger guys, so this would have been a big adjustment for him. I could hear the people by the ring laughing again. One of them said in Thai ‘does he know he’s sparring with a girl?‘ and I became really frustrated at the whole situation. I felt like I couldn’t land anything on Tu at all, until luckily, I managed to land a clean cross on his chin, but then he immeditately responded by snapping a strong jab into my face and laying on me with kicks, which left me really deflated. As soon as the round ended, I left the ring and went to the bathroom to let a few tears out, it was one of those sessions. I managed to re-coup for padwork and bagwork, then came back to Tu for clinching at the end. We’ve clinched before and although it’s really difficult for me, I’ve always enjoyed it. On this occasion, I was running on empty from the start. It wasn’t that I was breathless, I just felt completely exhausted. We pushed through for as long as I could, but all in all, it wasn’t a great session for me and definitely not a confidence booster before a fight. Still, I was glad to have done it and looked forward to having a day’s rest afterwards. That evening, several people had expressed to me that they didn’t think I should be fighting. Tu sat me down and gave me a big talk about how I didn’t feel strong and that I shouldn’t have accepted a fight on such short notice after being so sick. I listened, but told him that I appreciated it, but as long as I was doing it, I needed him on my side for support. He agreed. I later Skyped with my Dad, who was also very vocal about his concern. When I told Master Toddy that I’d be fighting that Friday, he reacted by stepping back, hesitating for a moment and then saying ‘but are you ready?‘ It was all quite disheartening to hear and although all of these people were probably right, at the time, I was frustrated that they weren’t on board with me. I felt that I could do it, which was the most important thing. When we arrived at Asiatique on the Friday, I saw a familiar face. I didn’t know her name, but I knew that she was from Kiatpompetch Gym and I’d seen her fight quite a few times before. 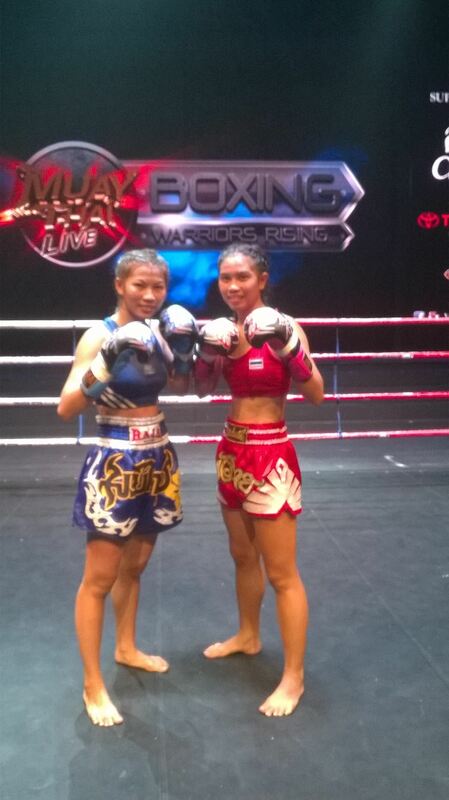 I wasn’t sure if she was my opponent because there are always Kiatpompetch girls there (their trainer is the promoter). She was also in relatively nice clothes and carrying a little Chihuahua around, so she didn’t seem like she would be fighting in 45 minutes. It wasn’t until we were about to go into the ring that I found out the she was indeed my opponent. Having seen her fight before and knowing that she would be a difficult one, I was a little intimidated. That was new for me. This fight was a bit of a blur. There are small, specific things that I remember about each round, but other than that, it all kind of blends together in my mind. I know that during the first and second rounds, I caught her with some good right punches, one of which rocked her, but didn’t follow up on them. She came back with some of her own, but didn’t follow up on those, either. She spent more time trying to clinch me, which is where I faltered and she was able to get the best of me. When she came in for the clinch, I became defensive and lifted my knee to block her rather than engaging and fighting her back in that space. It could have been because I was tired, or it could just have been that I felt weaker in general because I’d been sick just before, and was just worried about being tired. I’m not sure if it was an entirely mental or physical thing, but it was a definite flaw. It was this that left me open for an elbow in the last round. It landed just under my left eye and the area started to feel warm and as if it was swelling immediately afterwards. Later in that round, she caught me with a right body kick that took the wind out of me for a moment. heard Colton in my corner shout ‘she’s tired, too!‘ and could see that he was right, so pushed on as much as I could. I landed some body kicks and some more right hands, but wasn’t able to throw anything with significant power, and there just wasn’t enough time. She was much sharper and stronger than me on the night, so deservedly won by decision. In her corner was a girl who’s fight name is ‘Dokmaibah Kiatpompetch’, who I met at my first fight when she fought on the same show. I walked over to the corner to say hello and ‘mai jer dtang naan‘ meaning ‘long time no see‘. We had a little chat afterwards, she was really friendly. When I came out of the ring, people crowded around me and Colton started icing my eye. It was only when he said something that I realised I had been cut. It turned out to be only a very small one, with just a little bit of blood. It wasn’t deep at all, but there was a Thai woman hovering around looking very concerned, who kept telling me that I should go to hospital. Everyone else around me stressed that I didn’t need to, but she said ‘I think it’s not beautiful for you!‘ Thaksaporn’s trainer, who is also the promoter, came over and said ‘Emma mai mi laeng‘ meaning that I had no power, and then walked away. It was then that I remembered that the last time I’d seen him, after I’d beaten two of his fighters by knock out, he’d implied that the next time I fought there, I would get cut. At the time, I didn’t quite get it because he’d just said ‘next time, doctor‘ and gestured with his elbow. For some reason, I wasn’t sure if he meant that I’d get cut or cut someone. Only then did it sink in. Of course he meant that I would get cut, I’d already stopped two of his girls on his own promotion, of course he wanted to get me back! Some people around me were pretty unhappy about that, but I couldn’t blame him. It’s all part of the game if you ask me. Remembering that I had medical insurance from my work, I decided to go to a hospital just to get the cut checked out. It was my first one, so I thought it was better to be safe than sorry. When the nurse was taking my details, we spoke in Thai and I informed her that the cut came from a Muay Thai fight. Strangely, she then asked me in English if I had been fighting with a friend and whether or not I had called the police. I’m not sure if she just didn’t understand me (which would be odd, because it was such a simple exchange) or if she was just taken-aback by the idea of me having a Muay Thai fight that she just assumed she had misheard me or that I’d translated incorrectly. I didn’t bother to explain any further. I then went through to see the doctor, who said that he would just dress the cut because it didn’t require stitches, but that he wanted me to do an x-ray to check for any bone damage. I thought that an x-ray was really unnecessary, but it’s difficult to protest when a doctor is telling you that you need one, so I just did it. Unsurprisingly, it came back totally fine and I waited for him to come back to treat the cut. When he did, he had for some reason changed his mind and decided that he wanted to consult with a surgeon, who immediately proceeded to give me stitches. When he finished, I asked him how many there were, to which he replied ‘I didn’t count, so I don’t know, but it’s a lot‘. This surprised me, because it was just a small cut. It turned out that he’d managed to fit eleven stitches in there! It was strange to go into a hospital thinking they’d just take a quick look and send me home, then coming out with eleven stitches in my face. Not only that, but 6,000 baht out of pocket! I later found out that this particular hospital has a reputation for trying to get as much money out of patients as they can, which was evident from the bill. They didn’t show me what was on it until after I’d paid it, after which I found that I’d been charged for a load of unnecessary medication (antibiotics, cream, tylenol, etc) that has since just remained unused in my cupboard. I’m not sure if I was given the stitches only for this reason, but I’m fairly confident that if I’d been a man, they wouldn’t have bothered. I think they were more concerned about scarring because I’m a woman. That being said, it has since healed very nicely, so I can’t complain too much. I’m just glad it’s done. Below are some pictures of how it looked, the first of me having just emerged from the hospital looking like a Nelly impersonator, and the second showing the healing process (click to enlarge). Thaksaporn was born in 1994 and also goes by Thaksaporn Songilachalermprakiet. 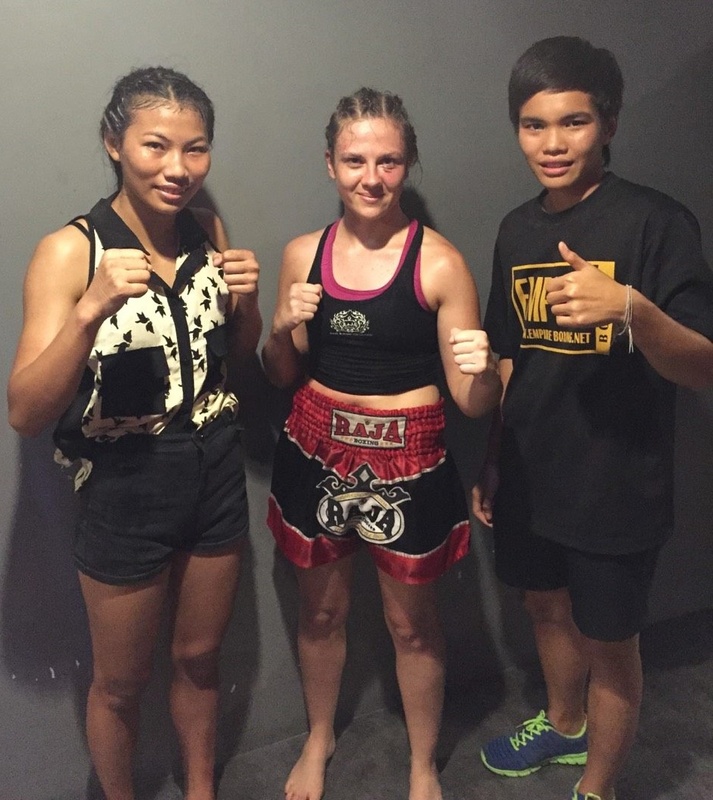 She is a student at a Bangkok sports school and a very active fighter. I first saw her at the Queen’s Birthday event at Sanam Luang last year, where she fought on the Muay Ying Association show, an all-female event managed by her trainer. On 25th March, she fought at MBK against Yolande Alonso from Bor Rak See Dam Gym in France, winning on points. After looking up Yolande, I found that she just fought Anissa Meksen for a WFC European title (they also fought in 2014, Anissa won both times). 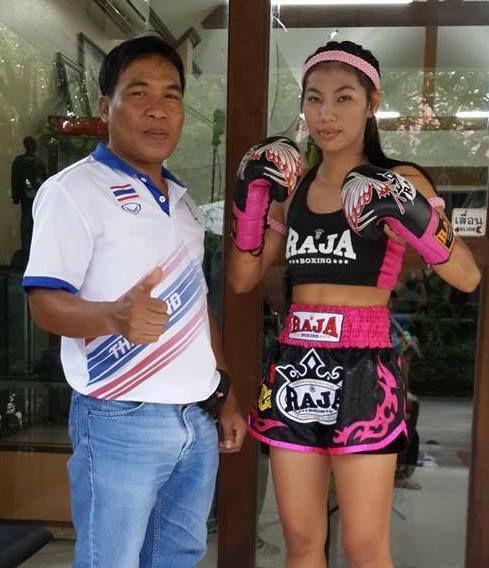 Thaksaporn and her trainer before her 2014 Queen’s Birthday fight. Since the Asiatique promotion started, Thaksaporn seems to have been fighting there a lot. She fought there the Friday before she fought me and then again two week after our fight. All three times, she won on points. Thaksaporn at Asiatique on 24th May. Opponent unknown. This fight wasn’t a particularly positive experience overall, but I still felt good coming out of it and I’d definitely like to arrange a rematch with Thaksaporn. She was a much better fighter on the night, but I’m confident that I can win if I go up against her again with better preparation. She’s a strong opponent and I think it would be a good fight. I’ll be going home for a couple of weeks soon, but am looking to put that together after I get back. Siriraj Medical Museum – The Creepiest Place in Bangkok?